ARE YOU READY TO RIOT!!! RIOT was inducted into the prestigious Heavy Metal History Hall of Fame 2018! Past inductee’s include Scorpions, Randy Rhoads, Lemmy, Slayer and others and this year will be inducted along side rock heavyweights Bill Ward from Black Sabbath, Carmine Appice, Billy Sheehan and others! 2018 See’s the legendary band sign to legendary metal record label Nuclear Blast and releases there 16th record “Armor of Light“ produced by whiz Chris “The Machine” Collier (Korn, Prong, Flotsam and Jetsam, Metal Church, Dokken, Slipknot etc). The new album is already rising up the charts and debuted on the German charts at #22 and Japan herold it as #1 two weeks straight! The new offering is pleasing fans of the ‘Thundersteel’ era of RIOT as main song writer and long time Mark Reale music collaborator Don Van Stavern does much of the writing as he did on ‘Thundersteel’ and ‘The Privilege of Power’. DVS is joined by 30 year RIOT band mate, song writer and Reale’s guitar partner of over 20 years Mike Flyntz to create what they feel is something they are proud to call a RIOT record! 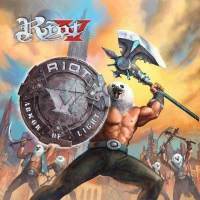 RIOT has a tumultuous history of member, label and management changes throughout the bands 30 plus year career but one things for sure, a bands longevity is through good music and if this new record is any proof, they will be around for years to come! July/ August 2018 saw RIOT sell out headline shows including this years Headbangers Open Air with Girlschool, Loudness and Anvil opening! Other appearances saw them at the Legendary Wacken Open Air, Legends of Rock and of course appearances at Rock Fest Barcelona, Loud Park, Fall of Summer, Metal Apocalypse, Bang Your Head, Rock Hard, Sweden Rock just to name a few and sharing the stage with heavyweights Judas Priest, Def Leppard, Nightwish, Arch Enemy, Hammerfall, Scorpions and Journey to name a few! Next month RIOT will head to Europe to co-headline “Apocalypse Over Europe“ with the great Primal Fear! Bursting out of New York City with ground-breaking albums ‘FIRE DOWN UNDER’ (Elektra) and “Thundersteel“ (CBS) RIOT quickly became one of the biggest metal bands in the world. Early stunning performances in the UK at Castle Donington and Wacken Festivals and support slots with Black Sabbath, AC/DC, Rush, Kiss to name and few cemented their reputation as the hottest ticket to see. With the Eighties developing into a metal-fest with Priest and Maiden tearing up the charts, a new-look new-sound RIOT bounced back transforming from an edgy hard rock band into a power metal assault with the widely acclaimed releases Thundersteel and The Privilege of Power, Riot was at the forefront of what we know today as power metal! This fifth chapter of the band continues to slay audiences world-wide to this day! With the mighty Nuclear Blast behind the band and with many more releases to come, and with reissues on Sony, EMI & Metal Blade, RIOT are consistantly on radio and metal charts worldwide, as well as being a part of New York Citys Top 20 Most Influencial Metal Bands, 100 Best Metal Albums of All Time, 100 Best Metal Bands of All Time and numerous mentions on VH1’s That Metal Show with Eddie Trunk and staff sighting RIOT as one of the inovaters of Metal music in America and beyond! RIOT truely are Metal Soldiers and will keep marching and fighting the good fight to bring you the music you’ve come to know, love and expect from RIOT.....Shine On! Founding member guitarist Mark Reale hired bassist Don Van Stavern to join the band in 1984 during the end of the Born in America tour. The renewed formation featuring Mark, Don, Rhett Forrester and Sandy Slavin, then based in LA, played and label shopped to no avail so upon Rhett and Sandy’s departure Mark and Don headed to New York to regroup, write music and search for musicians!